Any new parent will tell you they’re often going to well-child visits. The American Academy of Pediatrics (AAP) recommends up to 12 checkups during the first three years of a child’s life. The regular visits create trust among pediatrician, parent, and child. According to the 2015 Colorado Health Access Survey, more than 90% of publicly insured Colorado children have at least one medical visit by age one. Yet only 10% of children in Colorado visit a dentist by their first birthday. That’s a huge gap between medical and dental checks for kids. The challenge is to break down access-to-care barriers. We want to address barriers like location, insurance status, and transportation issues. The solution is to meet families in places that are familiar and comfortable to them. 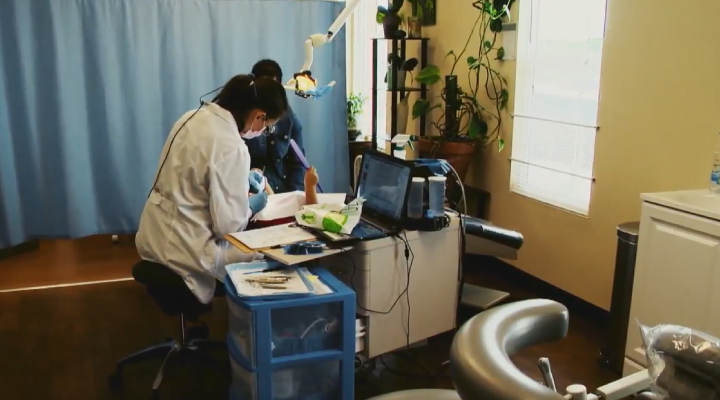 That’s why the Colorado Medical-Dental Integration (CO MDI) project was developed. By placing a registered dental hygienist on to a medical care team, oral health care is more connected to overall health care. Delta Dental of Colorado Foundation initially funded 16 medical organizations to pilot CO MDI. The locations ranged from primary-care medical settings and school-based health centers to federally qualified health centers and beyond. In just over two years, Wave I grantees have seen more than 36,000 patients. Seventy-two percent have public dental coverage through Medicaid or Child Health Plan Plus. Delta Dental of Colorado Foundation announced funding opportunities to expand CO MDI to 10 more clinics. Learn more about the CO MDI project and apply online to be part of Wave II of this innovative health care solution.